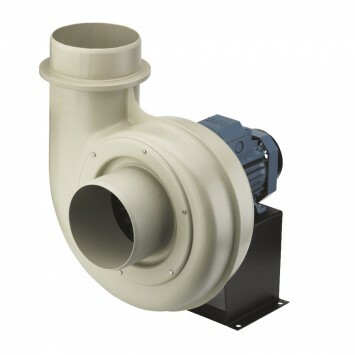 Range of single inlet direct drive centrifugal fans manufactured from tough polypropylene plastic and designed for extraction of corrosive fumes. Provided with forward curved centrifugal impellers manufactured from polypropylene plastic. Available, depending upon the model, with single or three phase motors in 2 or 4 poles. -Single phase 230V-50Hz, on request. The scroll can be orientated.